Hem hem… there’s a new Harry Potter announcement this week. Pottermore, the official Harry Potter site, has featured a variety of odd clues and games with the promise that “all will be revealed October 31.” Today, it’s been announced just what will be revealed on Halloween: a new story from J.K. Rowling. It’s not her first foray into the backstory of her characters, though this one takes a more sinister slant with the promise of “many new details” about one Dolores Umbridge, the witch who basically takes over Hogwarts by appointing herself High Inquisitor. (And, as Rowling points out in her statement, Umbridge is the only other person/thing besides Voldemort who has left Harry with a physical scar.) Professor Umbridge first appears in the fifth Harry Potter book, Harry Potter And The Order Of The Phoenix, and forces Harry to write “I must not tell lies” with a blood quill that left the writing on his hand. Although Umbridge is a nasty piece of work, there’s plenty of room for Rowling to explore more sides of her character. 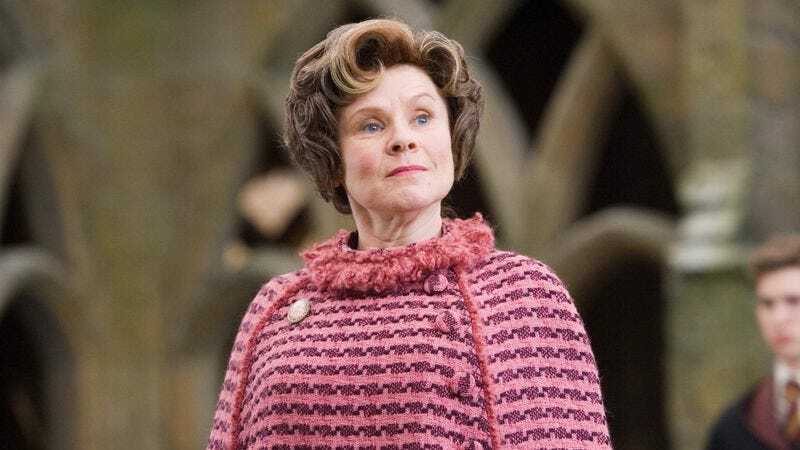 Umbridge was particularly malicious toward Muggle-born wizards and other “half-breeds,” having drafted anti-werewolf legislation during her time at the Ministry Of Magic. We’re guessing this purist zealotry has its roots in some kind of tragic past; only one more week to find out just what that is.